* 11lbs Lighter than Steel If you're building an all-out competition car, you need a lightweight flywheel that will allow the engine to rev quicker and not eat up a lot of power. RAM billet aluminum flywheels greatly reduce rotating weight, to permit quicker revving and higher power output, but still retain enough mass to resist heat distortion that could adversely affect clutch performance. These flywheels are CNC-machined from certified materials and have a rugged steel friction-surface insert. 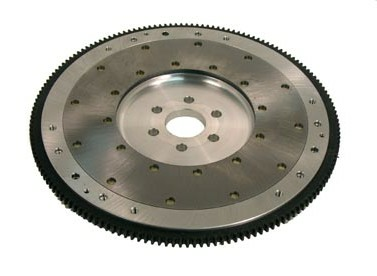 The insert is Blanchard-ground parallel to the crankshaft flange after installation, to minimize runout and provide the optimum clutch-mating surface. These flywheels are SFI-approved. Quality Construction: No one else gives you the bold clean styling of our Aftermarket Dress Ups, Suspension and Performance Parts for your American Muscle Car like UPR Products! Fits these Vehicles: 1981 1982 1983 1984 1985 1986 1987 1988 1989 1990 1991 1992 1993 1994 1995 V8 LX Cobra GTS GT Mustang Roush & Saleen Vehicles. Made in the USA!